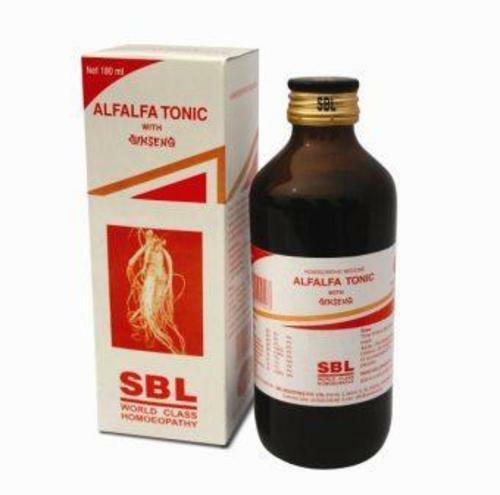 Product Description: SBL’s Alfalfa tonic with ginseng is a combination of well proven drugs of homoeopathic therapeutics. SBL’s Alfalfa Tonic is a natural source of essential nutrients, vitamins and minerals. Alfalfa tonic takes care of debility specially caused by wasting diseases like Tuberculosis, Typhoid, Irritable Bowel Syndrome (IBS), Malignancies, and Diabetes mellitus. It is recommended during Pregnancy and Lactation and above all it increases appetite. SBL’s Alfalfa Tonic contains mother tinctures of Alfalfa, Avena sativa and Ginseng. Alfalfa and Avena sativa provide essential minerals and vitamins whereas Ginseng builds resistance to fight against infections, works as revitalizing agent and removes mental and physical debility and helps in faster recovery. SBL’s Alfalfa tonic has invert sugar base and can be given to diabetics also. Since year 2000 we are in the field of selling of homeopathic medicines. We do retail as well as whole selling. We keep medicines of all best branded companies like-SBL, LORDS, WHEELAL, SCHWABE'S, etc.